Homestyle Filipino food draws lunchtime crowds. 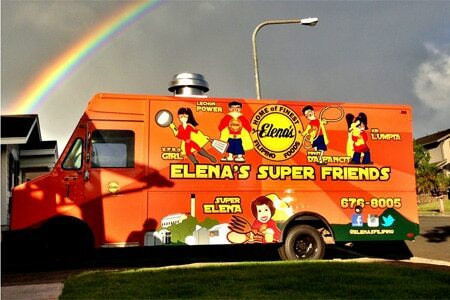 : Elena’s bright orange lunch trucks offer hearty Filipino fare such as the signature adobo fried rice omelets, pork gisantes (with green peas stewed in tomato sauce), pansit noodles, and the eggplant and bitter melon filled pinakbet vegetable stew. Don’t miss the lechon special: crispy pork belly seasoned with fish sauce and tossed with tomatoes, onions and green onions. A brick-and-mortar outpost of Elena’s Restaurant is located at 94-866 Moloalo St. Ste. D4A, Waipahu, 808-676-8005.